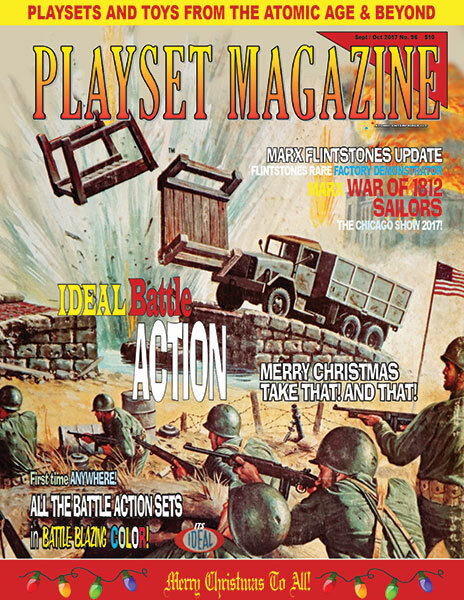 PLAYSET MAGAZINE ISSUE 96: IDEAL BATTLEACTION! IDEAL’s BATTLE ACTION is the order of the day, and the general has demanded plenty of it! That’s why this Christmas is a spectacle of color directed at the great Ideal toys of the 1960’s which blast, fire, blow up o otherwise caused mayhem on the living room floor. Battle Action, with impossibly cool graphics, were plastic toy battleground parts (if you have see the War Totys DVD you’ve seen how Bob Jones linked all his together by a dangerous supply road down which traveled a supply truck headed for the Secret Air Base but which first had to get through Checkpoint Charlie, with the sentry that comes out of his guard post and lowers the crossing gate; has to snake across the Warfield Road, get past the Twin Machine Gun Nest that fires away and sweeps the area with deadly fire; all the while the twi recoiling cannon blast away. Then there is the Exploding Bridge, the Mined Road and more. Battle Action delivers the good in many ways, and it’s all featured here on our pages. Says Bob, “They’ve never been covered completely like this before, and I’ve seen all the internet sites and articles.” They’re all here in two page spreads, vintage catalogs, and a detailed look at each and every colorful plastic creation that shoots, blows up, booms or streaks into the sky. Plus, MPCs Jungle Warfare store display, the new book from Atomic “Marx Civil War” reviews, Mosby’s Raiders conversions and rare Flintstones Demonstrator all turn up on these guts n’ glory pages. We’ve also got a ton of good reading with Marx War of 1812 Sailor figures, the Mosby’s Raiders conversions, and some worthy updates. Plus the Chicago Toy Soldier Show has just wrapped up and we are going to press with complete coverage including exclusive first-look pix of the towering new Trojan Horse and the long ships, plus new Greek and Trojan character figures (can you say “Achilles” and “Paris”?)! !.